Price: £149.00 / €208,60. Disabled in demo: Load/Save, Import/Export, MIDI controllers, Multiple instances, Patch renaming, Automation, Audio fades down randomly. Min: Mac OSX 10.2.4, 450 MHz G3 Processor, 256 MB RAM, 10MB free hard disc space, 800*600 pixel display. Host application. 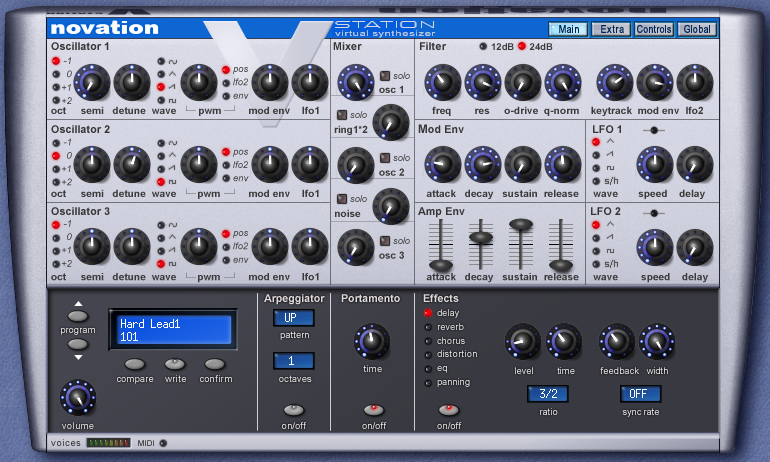 V-Station is a plug-in version of the hardware K-Station. Bugfix for crashes with large projects (> 2GB) in Windows 64-bit. Bugfix for crashes and occasional stuck notes with certain rare note on/off message sequences.